Who’s Who in The Choir? 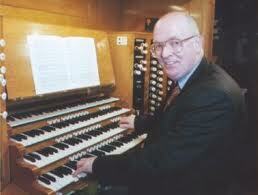 Simon Lindley is Conductor of Sheffield Bach Society and one of Britain’s most popular organists and choral directors. He is Organist and Master of the Music at Leeds Minster and also City Organist for Leeds, positions he has held since the mid 1970s. Additional to his Sheffield responsibilities, Dr Lindley is Music Director of Leeds-based St Peter’s Singers and conductor of Doncaster Choral Society and community choruses in Halifax [Overgate Hospice Choir] and at Leeds College of Music. In July of 2012, an Honorary Doctorate of the University of Huddersfield was conferred upon him for his services to choral music locally, nationally and internationally. Born in London, the son of an Anglican priest and a writer, Simon was educated at Magdalen College School, Oxford and the Royal College of Music. He still sustains strong links with the City of London where his career began in the 1960s – he is Churchwarden of the Musicians’ Church [St Sepulchre-without-Newgate] and Chairman of the Friends of the Musicians’ Chapel there, and a Liveryman of the Worshipful Company of Musicians. A former President of the Royal College of Organists and the Incorporated Association of Organists, Simon has worked for over forty years in many capacities for the Royal School of Church Music, of which he is an Honorary Fellow; Simon holds similar distinctions from the Guild of Church Musicians and the Guild of Musicians and Singers together with an Honorary Doctorate of Leeds Metropolitan University for services to the musical and civic life of his adopted city. He is active, though in a modest way, as a composer and arranger for church choirs of all traditions and abilities and his setting of Ave Maria has achieved widespread prominence along with being included on Katherine Jenkins’ acclaimed CD Sacred Arias. An extensive discography includes two best-selling Naxos discs – French Organ Music from Leeds Parish Church and Handel Concertos with Northern Sinfonia as well as many recordings with the Orchestra of Opera North for Naxos and, on the Chandos label, an awarding winning performance of the fiendishly difficult Khachaturian Organ Symphony recorded in Leeds Town Hall live with the BBC Philharmonic. Other Chandos releases include accompaniments in cornet virtuoso Phillip McCann’s series The World’s most Beautiful Melodies and several acclaimed performances with Huddersfield Choral Society. Dr Lindley lives in Fulneck, near Pudsey, and gives regular organ concerts in the village as well as at Leeds Town Hall and Leeds Minster.